As FBI agent Renee Walker on Fox’s hit series “24,” Annie Wersching is a formidable partner for Jack Bauer (Kiefer Sutherland). As tough as he is and just as smart — if not even more cunning — Renee is a girl’s girl whom every man wants. Wersching says her television counterpart is a lot more skilled than she is in most things, but she says there is no way Renee could out-dance her. Wersching was in a Celtic step-dancing troupe for more than 14 years and returns to her hometown of St. Louis every year for St. Patrick’s Day to watch Irish dancing. Wersching recently returned from her first trip to Portugal, where she enjoyed an action-packed vacation. My parents went to Italy a lot, but I didn’t go with them. I can’t believe that! Until recently, the only places I’d been to a lot were Canada and Mexico, and that bummed me out. I really wished I had done the backpacking-through-Europe thing when I was younger, but I was busy doing musical theater. I’m trying to make up for lost time now. 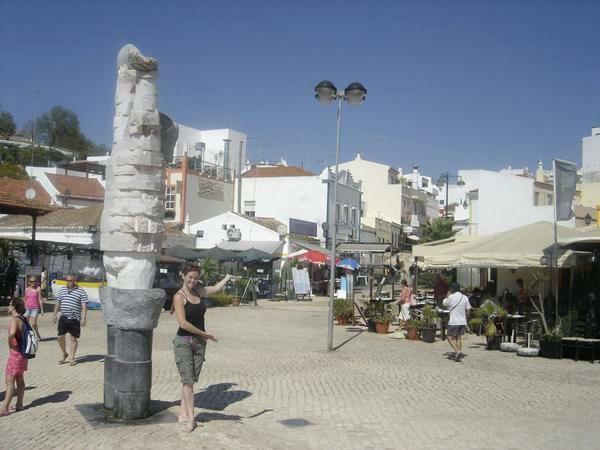 It will always hold fond memories for me because I was in Portugal when I found out I had an audition for 24. I was there because a friend of mine was working on a film there and was going to travel around Europe for a bit. I had two weeks off so I met him in Madrid. We also went to London and just had the best time. I got to see a lot without being rushed around too much. I just got back from Munich and London. I was doing press to promote 24 over there. I know some people get tired of doing that, but it’s still new to me. I’ll volunteer to go overseas at the drop of a hat. I am pretty good about it. I knew that we’d be taking the overnight train from Spain to Portugal, so I wanted to travel lightly. It’s not fun dragging a bunch of bags from one country to another, especially when you never even wear half of what you brought. When I travel for work, I have to have different outfits for photo shoots and interviews and then, of course, I need matching shoes and accessories. That gets a little more complicated. I’m not big on collecting things from trips, but I did save one thing. We took the overnight train from Madrid to Lisbon. That was very cool and very “murder mystery.” I bought a very pretty bottle of wine that had this unique flat, oval shape and had a picture of Portuguese architecture on it. I liked it so much I brought the bottle back home with me. Of course, it was empty by then. Portugal has amazing seafood with all the eyeballs staring back at you. It was so much fun to look at, but I don’t eat seafood. I ordered all the sides, like potatoes and salads and I just loved all the delicious flavors. You won’t go hungry in Portugal, that’s for sure. I tend to stay away from the big tourist traps. We were down in Lagos with friends who had a charter school. We went out on a boat and even learned a little bit about sailing. My mom used to sail, but I’d never done it before. The closest thing I had done was tie the boat up with a rope. I’m very much a cabin-on-a-lake kind of girl more so than someone who likes to lie on the beach and work on my tan. I like doing things. Not that I don’t love the beach — I do! But I like moving around. I want to be on a boat or climbing around in trees or hiking through the rain forest. I guess I’m always looking for something a little otherworldly.